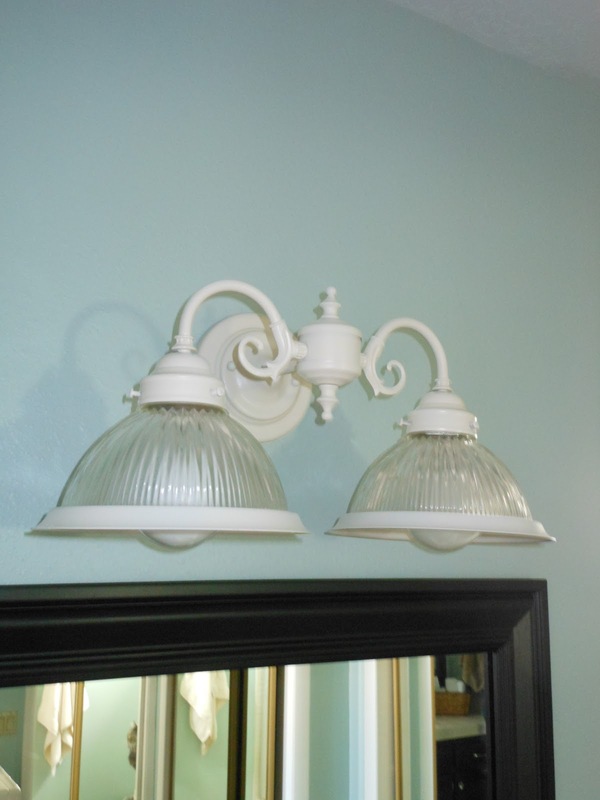 We have a few more projects completed in the Master Bathroom. Woot woot! My initial scheme is starting to come together. 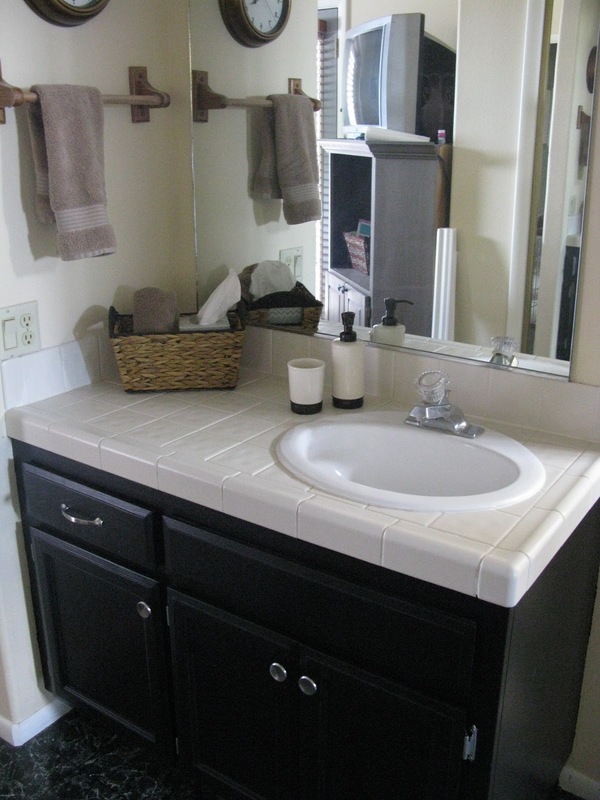 The first part of the transformation I showed you involved refinishing the cabinets. To check out that mess go here. Don't get me wrong, this improved things A LOT! 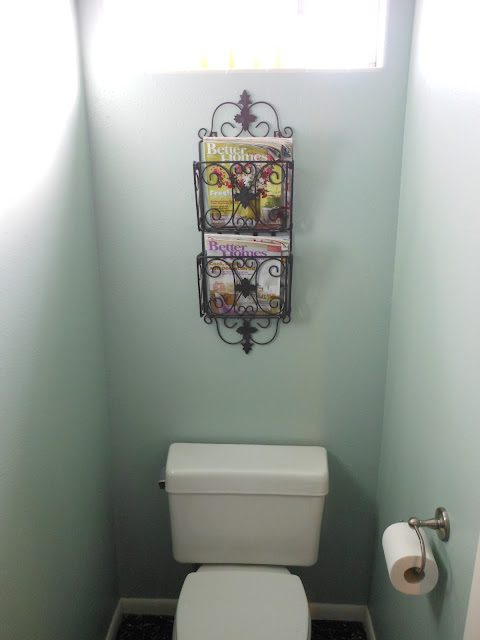 I hung a magazine rack on the wall that had been sitting on the floor next to the toilet for 2 years. I know, just a bit ridiculous. Now the magazines have a better spot than on top of the toilet tank. Before hanging this, there was an ugly wood towel rack in its place. I don't know about you, but there is something that grosses me out about hanging a bath towel over the back of a toilet. Plus, it was really inconvenient. Ask, my husband since his towel hung here. Oh, and I got a new toilet paper holder. Doesn't seem like much, but it just freshens the space up. The next thing I did was put up a series of hooks to hang our towels from. 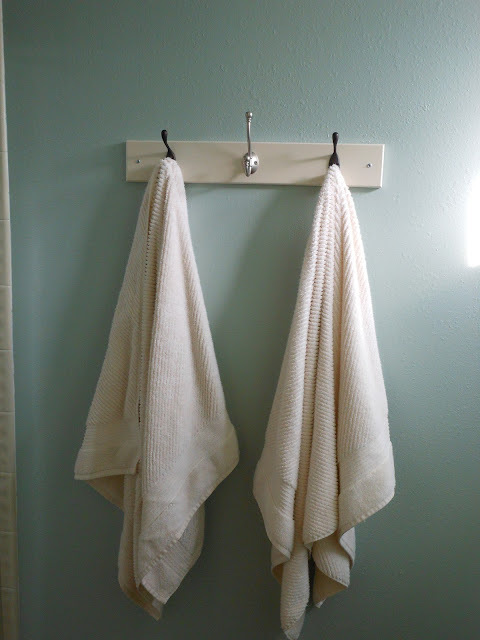 There really wasn't room to hang two towels from a rod, so hooks it was. I had bought the board from the DI for a buck (it used to be navy blue and say America on it) and I already had the two bronze hooks. So I bought the brushed nickel hook for maybe $3-$4. Oh yeah, I had the spray paint for the board already left over from another project. You may have noticed I'm mixing my metals a bit here. I don't mind it...my husband isn't the biggest fan. I don't think he'll change it anytime soon though. Darn it! I still need to counter sink those screws I used to hang this with. Definitely not perfect yet! Isn't it amazing how the wall color changes based on the lighting? The light got an update a couple of times. I like the color I ended up with though. 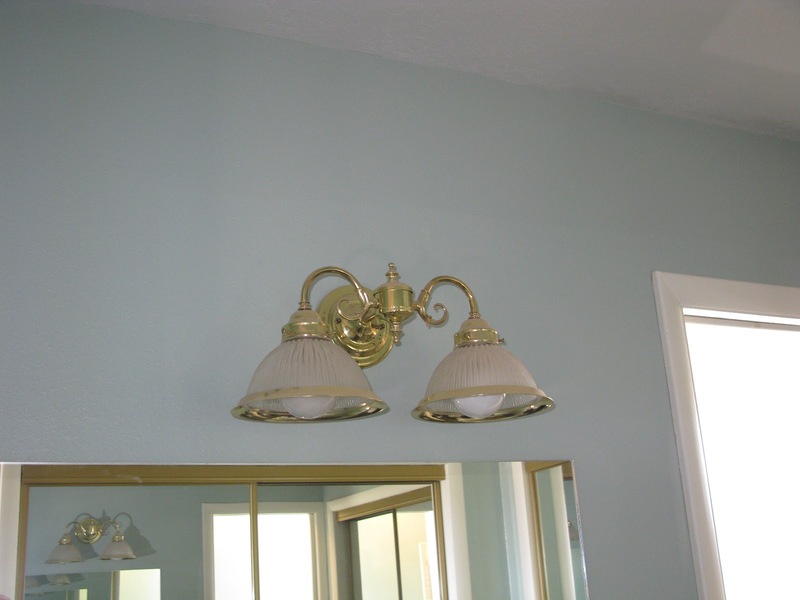 The clock got the same update the light did and another hook took the place of the ugly towel rod. Hooks just seem to work better than other solutions in my house. The towel actually gets hung up. Finally, we framed out the mirror. 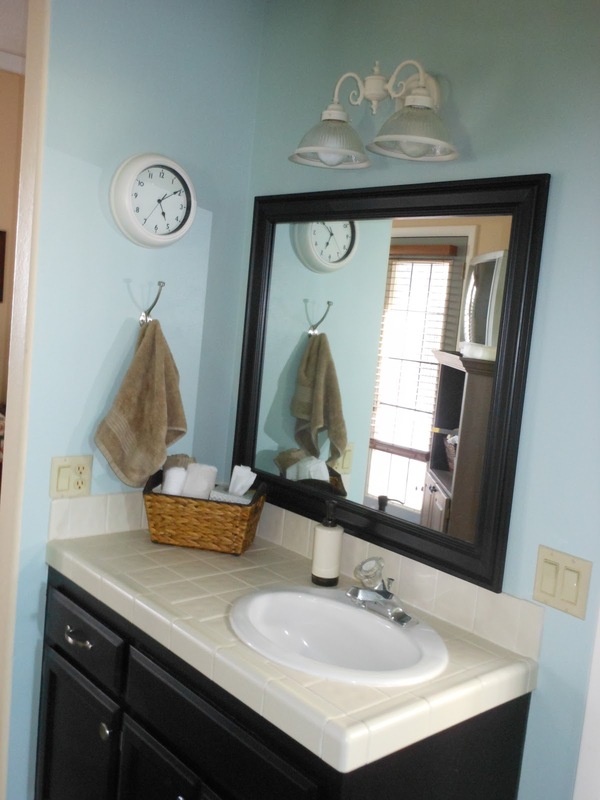 I can't decide which I like best, the pretty mirror or my refinished cabinets. Everything seems to be more cohesive and finished looking now and we are really enjoying the space. Of course, there is always more to do. I'd still like to update the faucet and put new flooring in to replace the 80's vinyl. We'll get there. 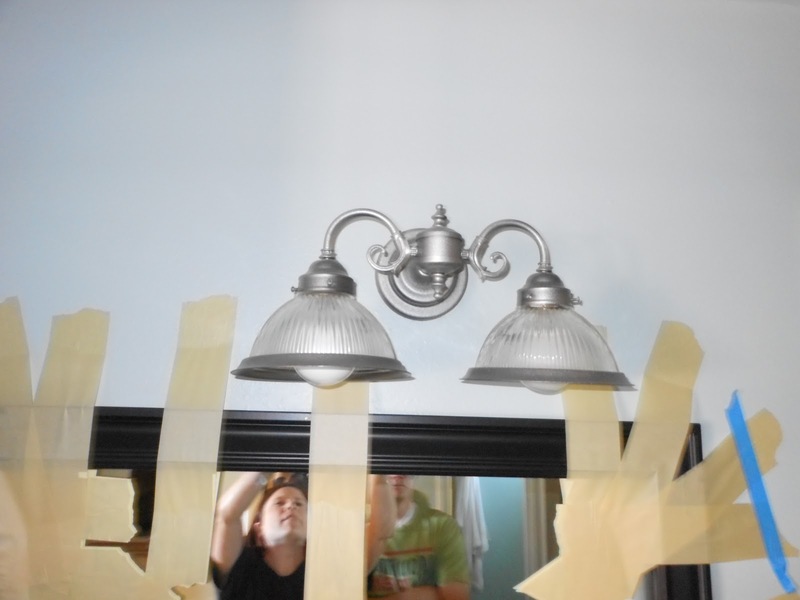 Later this week I'll give a bit more detail on how we did the mirror, plus the light drama. I just figured you might want to see the (so far) finished project first. I like it so much it just makes me smile. Even better I think the whole thing cost us about $75 dollars total...not too bad! Someone did a masterful job of mitering the frame around that mirror. Heather, I'm liking the changes you have made so far! Very nice. You have some great updates here!!! I'm having a giveaway...hop over and check it out. 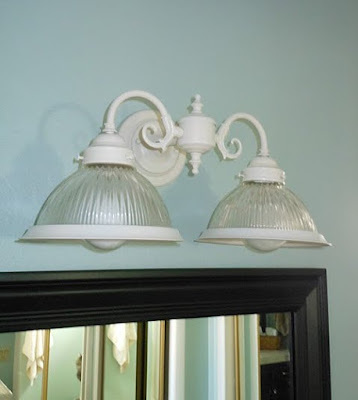 Lovely updates and your bathroom is looking great! I particularly like the BH&G mags in your rack. Ha ha. It looks familiar from my bathroom! 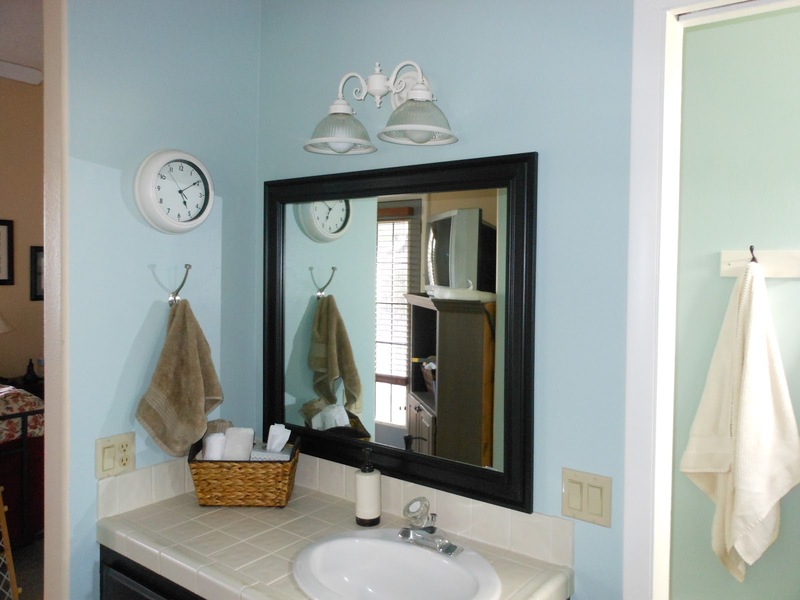 Your bathroom looks great. Thank you so much for linking it up to Savvy HomeMade Monday!